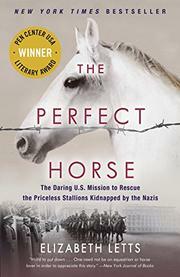 A singular spotlight on the concerted World War II effort to save Lipizzaner stallions. Letts (The Eighty-Dollar Champion: Snowman, the Horse that Inspired a Nation, 2011, etc. ), a lifelong equestrienne, eloquently brings together the many facets of this unlikely, poignant story underscoring the love and respect of man for horses. The horses in question were rare Arabian thoroughbreds introduced to Europe by the Ottoman Turks in the late 17th century and subsequently bred in Poland. The Bolsheviks had slaughtered nearly the whole stock in 1917, deeming them the “playthings of princes,” though the Polish stud stable at Janów Podlaski was finally beginning to thrive again by the time of the Russian-Nazi invasion of Poland in late 1938. Two important equine sagas, handled well by the author, converge here: the German takeover of the Janów stud farm, led by German Olympic organizer Gustav Rau, in order to reassemble the Polish horse-breeding industry for the glory of the Third Reich, which desperately needed horses for mounted troops; and the attempts to save the working Lipizzaner stallions at the aristocratic Spanish Riding School in Vienna, led by Alois Podhajsky, who had won the bronze medal in dressage at the 1936 Berlin Olympics. Under Rau, the stud farm was moved to Hostau, Czechoslovakia, by October 1942, and put under the care of Polish civil servant Hubert Rudofsky, who successfully increased the number of bred Lipizzaners by 1944. With Allied bombs falling on German cities, and eventually Vienna, Podhajsky determined that his horses had to be moved to safety, eventually housed in the village of St. Martin, Austria, yet the Nazi-controlled Austrian government was loathe to relinquish control of such a symbol of Austrian determination. Enter the Americans, specifically Maj. Hank Reed of the 2nd Calvary, which had traded in tanks for horses to fight the Nazis across France, and the exciting meeting of Gen. George Patton’s army at Hostau. The author’s elegant narrative conveys how the love for these amazing creatures transcends national animosities.